Automation is key to the success of any growing dropship business. Jetti is here to help you manage your own automation, ensuring you don’t come unstuck on any of the little details that could mean the difference between a bustling, thriving business and one that’s failing to expand. One of the key areas we recommend customers automate is commission rates. Not only are commission rates potentially complex to manage, they can also prove incredibly time consuming if dealt with manually. When you use Jetti, manually tracking pricing becomes a thing of the past. 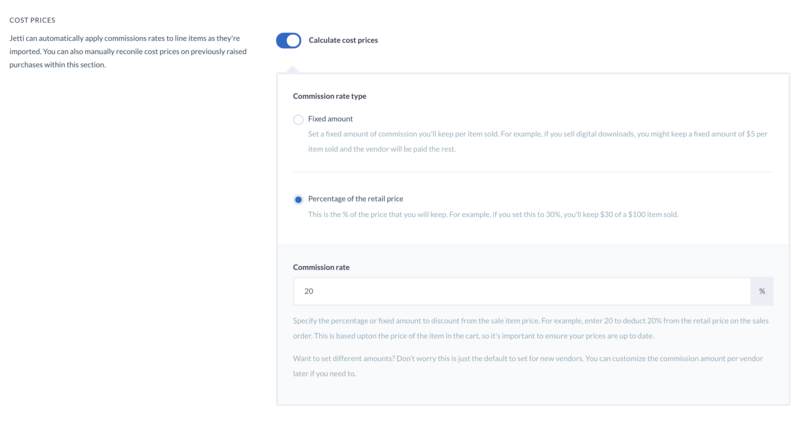 You can automatically calculate commission rates for all items sold. You can even import cost prices in batches, directly from your vendors. Here at Jetti, we know dropshipping. So you can rest assured that we understand how every vendor is different. That’s why Jetti enables you to configure different commission rates for each vendor. Not only that, you can even calculate more advanced costs, such as transaction fees and shipping costs.